We will take you for a bird’s eye view of the city from Signal Hill. Visit and shop at our Local Filipino Market which offers varieties of handicrafts, food and beverages. A visit to our most prominent landmark, Sabah State Foundation, 32 Storey Building with its unique design. Unravel Sabah’s multi-racial heritage at the state Museum, Mosque, Poh Toh Tse Buddhist Temple, Likas Sports Complex and Tanjung Aru beach. Kota Kinabalu, the gateway to the rest of Sabah, is also the State Capital with population of around half a million people. Kota Kinabalu, or affectionately known as K.K. 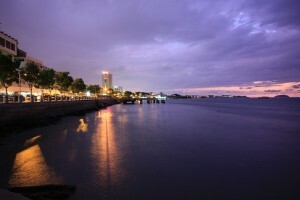 is a new vibrant city, developing rapidly with beautiful waterfronts and interesting night life for the night birds.